If you want, you can even create your own styles, by making a copy of glDatePicker.default.css and altering the styles within the file (be sure to rename from gldp-default to gldp-xxxxxx where xxxxxx is the name for your style). Create your input control that will trigger the date picker to become active when it receives focus or the user clicks on it. Optionally, if you want the date picker to appear in a specific div element, give your input control a unique gldp-id attribute and reference that id value in your element's gldp-el attribute. 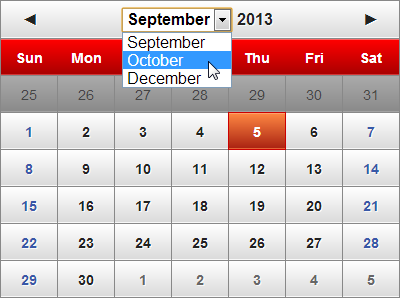 The example below shows a custom element where the date picker will be rendered. Include jQuery script followed by the glDatePicker script. Then attach glDatePicker to your control(s). This absolute bare minimum for attaching glDatePicker. The calendar will use all default options. Set a specific selected date and then restrict the selectable dates using ranges and individual dates. This calendar also prevents selection of months and years and traversing to previous and next months. This example shows how you can use a custom style and mark certain dates as special dates. 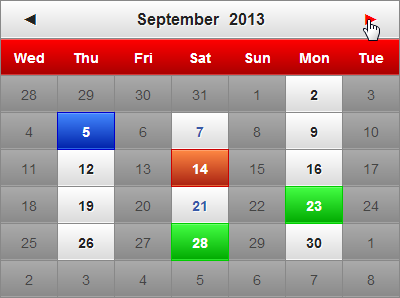 The special dates are also set as repeatable, and their data is returned on a custom callback. This example restricts selection to the years 2012, 2013 and 2014, the months September and December and the days Monday, Thursday and Saturday. The first day of the week is also set to Wednesday. 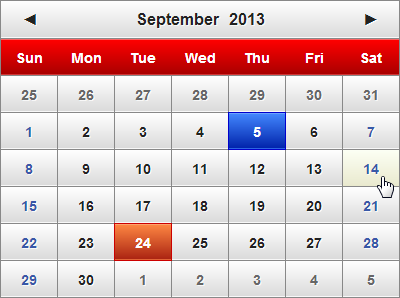 This demo shows how you can change the behaviour of the calendar on the fly by modifying some of the properties. Refer to examples.js to see the code on how this is done. Below is a list of properties that can be passed to glDatePicker to alter its behaviour. Refer to the comments above the properties to understand what they do. Default values are shown. // the stylesheet, using the class naming convention "gldp-cssName". // The z-index for the calendar control. // The number of pixels to offset the calendar's position on the page. // Set to true if you want the calendar to be visible at all times. // NOTE: If your target element is hidden, the calendar will be hidden as well. 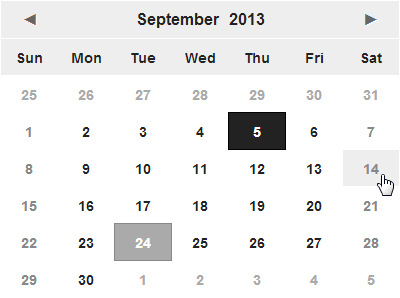 // Hide the calendar when a date is selected (only if showAlways is set to false). // Allow selection of months by clicking on the month in the title. // Allow selection of years by clicking on the year in the title. // The date that will be treated as 'today'. // The date that will appear selected when the calendar renders. // By default it will be set to todayDate. // Arrows used for the Previous and Next month buttons on the title. // Set these to blank to hide the arrows completely. // A collection of dates that can be selectable by the user. // the repeatYear or repeatMonth flag to true. // By default repeatYear and repeatMonth are false. // A collection of date ranges that are selectable by the user. // (repeatMonth is not supported). // property supports both repeatYear and repeatMonth flags. // data attached to it that will be returned in the onClick callback. // The data field can be any custom (JSON style) object. // This example creates two (repeatable by year) dates with special data in them. // The first date also assigns a special class (which you will have to define). // on the title to select from the dropdown. 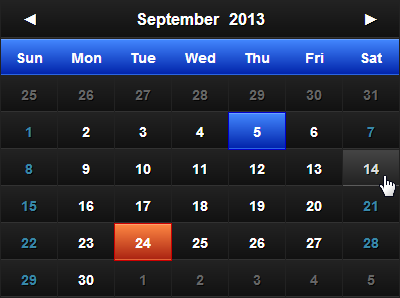 // List of selectable days of the week. 0 is Sunday, 1 is Monday, and so on. // Names of the month that will be shown in the title. // Names of the days of the Week that will be shown below the title. // The day of the week to start the calendar on. 0 is Sunday, 1 is Monday and so on. // Callback that will trigger when the user clicks a selectable date. // Callback that will trigger when the user hovers over a selectable date. // This callback receives the same set of parameters as onClick. // Callback that will trigger when the calendar needs to show. // You can use this callback to animate the opening of the calendar. // Callback that will trigger when the calendar needs to hide. // You can use this callback to animate the hiding of the calendar.